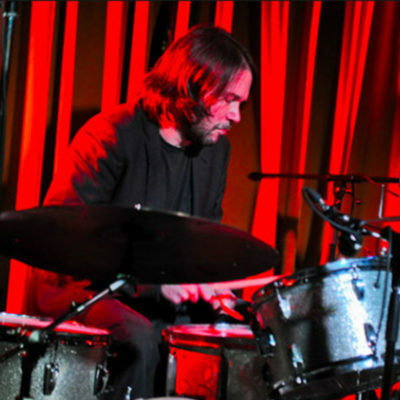 Bill Dobrow is a drummer, percussionist and music producer living in New York City. He has a broad range of experience touring with and recording for some of his generation's most celebrated artists, including: The Black Crowes, Sean Lennon, Yoko Ono, Norah Jones, Martha Wainwright, Lisa Loeb, Jesse Harris, and Joseph Arthur & The New Professionals, featuring Mike Mills of R.E.M.. Recent television appearances include The Late Show with Stephen Colbert, The Late Show with David Letterman, The Tonight Show with Jay Leno, and The Conan O'Brien Show. He is a frequent performer in the New York downtown music scene, with his own groups as well as with other artists. Recent NYC shows include Patti Smith, Rhymefest, Anthony Wilson and Vinicius Cantuaria. In between his New York schedule, he is also currently playing some festival dates on the road with Valerie June. In Brazil, Bill can be heard on chart topping records by Maria Gadú, Tiago Iorc and others. He co-produced the album "Sub Rosa" in Rio for Grammy Award winning songwriter, Jesse Harris, featuring luminaries such as Conor Oberst (Bright Eyes), Bill Frisell, Melody Gardot, and others. Bill records and composes music for film and television regularly, ranging from producing the theme song for "Dragon Tales" to playing on the award winning documentary of Joan Rivers, "A Piece of Work." Most recently, he composed music for the feature film, "Outliving Emily," and the award winning documentary film, "Sweet Micky For President." He has also appeared in feature films, such as "The Hottest State," written and directed by Ethan Hawke. Bill has a Bachelor of Arts degree in Music and Literature from Bennington College. He studied Black Music and Improvisation with Milford Graves. When performing at The Roxy, Bill’s ensembles are distilled from his musical collaborations in jazz improvisation and the crafting of music for singers in an array of styles. The lineup, which evolves steadily, draws from a rich pool of local and international talent. Recent guest appearances include Henry Butler, Valerie June, Miho Hatori of Cibo Matto, Anthony Wilson, Vinicius Cantuaria, Jesse Harris, Sasha Dobson, Kaliné, and Alexia Bomtempo…backed by world class musicians such as Al Street, Clark Gayton, John Sneider, Paul Gill, Jesse Murphy, Guilherme Monteiro, Helio Alves, and others.